Editor’s Note (G. Damm): Murithi Mutiga, an editor at the Nation Media Group in Kenya, wrote for the NY Times and we bring some extracts from this article. You can read the full article HERE. Kenya recently endorsed anti-trafficking laws that contain some of the harshest penalties in the world, and President Yoweri Museveni of Uganda has told game park rangers tracking illegal hunters to shoot to kill. [But] the authorities must look beyond the law-and-order approach against poachers and invest in winning the support of local communities, which could be their greatest allies against wildlife-trafficking syndicates. Wild animals may hold a special place in our global heritage, but all too often they threaten the livelihood of the farmers and herders who live near nature reserves and game parks. Elephants routinely trample precious crops, and carnivores sometimes ravage whole herds of livestock. African countries have much to learn from Nepal (see box below). [Whilst] most Kenyans support conservation efforts, in a country where arable land is exceedingly scarce and about a tenth of the land area is reserved for national parks and reserves, the authorities should take a more sophisticated approach in winning local support for conservation initiatives. In his memoirs, “Dreams From My Father,” Barack Obama records the mixed feelings of many Kenyans on this issue. When, as a young man on his first visit to Kenya, he suggested to his half-sister Auma that they should make a trip to a national park she was decidedly unenthusiastic, and her retort summed up a view of the tourism industry in Africa that’s rarely voiced outside the continent: “Why should all that land be set aside for tourists when it can be used for farming? These wazungus [white people] care more about one dead elephant than they do for a hundred black children.” Auma’s viewpoint sums up the position of Kenyans who want to preserve their heritage but also chafe at an approach that does not take sufficient account of the plight of local communities. While most of Africa is embroiled about current debates over commercial poaching of rhino and elephants, and the links between poaching and the ivory trade and consumer markets in Asia, it is perhaps useful to pause for a moment and reflect on one aspect of the current rhino and elephant poaching crisis that is rarely being discussed – namely that the poaching crisis has not materialized at all in certain countries with lots of rhinos or elephants. Most noteworthy is the reality that Namibia, which holds Africa’s largest population of black rhinos outside of state protected areas (and the second-largest population overall, with about 1700 black rhinos), seems to have completely avoided the poaching epidemic, even as neighboring South Africa lost over 1,000 rhinos last year, Namibia is reported to have lost a total of 3. This is all the more remarkable in that many of Namibia’s rhinos live on unfenced communal lands in remote rural areas- quite unlike the rhinos subject to 24-hour surveillance which are now the only ones that can survive in much of Africa. There are a range of factors that could explain Namibia’s successful anti-poaching record in the face of the surge in poaching nearly everywhere else. The country generally scores well on annual corruption rankings (i.e. relatively low corruption compared to other African countries), which may contribute to effective protected area governance and law enforcement- but then South Africa also scores similarly well on those same corruption indices. Perhaps the most remarkable aspect of Namibia, though, is the degree to which it has spread the benefits of wildlife and tourism throughout the rural population- including both private and communal landholders. The recovery of wildlife on both private lands and ranches, which dates back to those landholders gaining rights over wildlife in the late 1960s and 1970s, and later on communal lands following the reforms of the 1990s that enable the creation of communal conservancies, is well documented. Elephant populations in Namibia have doubled in Namibia since the 1990s, rhinos have recovered both inside protected areas and on communal lands, and other species from lion to mountain zebra have increased as well. Namibia’s experience in relation to the current poaching crisis is noteworthy in relation to recent reports from an entirely different and non-African geography- Nepal- of similar success in preventing poaching. Nepal also has a large population of rhinos – more than 500, mostly in Royal Chitwan National Park – and an exceptional track record of community-based natural resource management, particularly in relation to its very successful community forestry programs and also benefit sharing initiatives around protected areas. It seems reasonable to speculate that the exceptional performance of countries such as Namibia and Nepal in preventing poaching is linked to effective law enforcement and protected area management, but also in large part to their unique policies of providing local communities with a meaningful stake in managing, governing, and benefitting from wildlife and other natural resources (Editor’ note: see New York Times op-ed on trophy hunting Namibia). This would seem to be an extremely significant factor in the overall wildlife trade and conservation debates dominating current conservation discourse in Africa and globally. 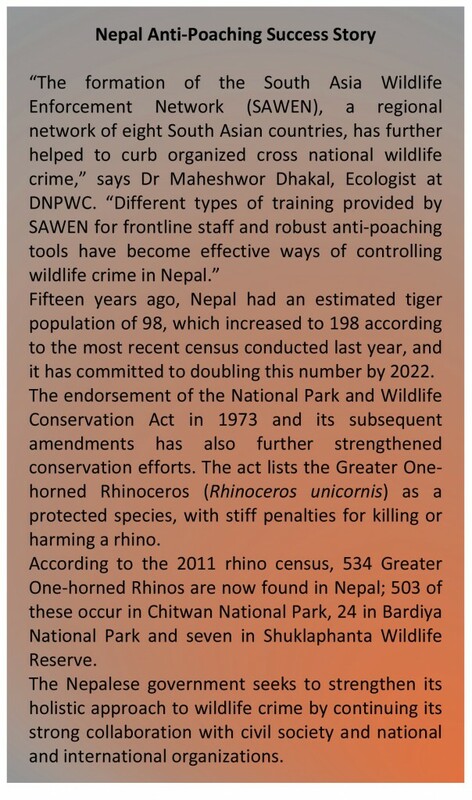 Deeper interrogation and careful analysis of why ‘aberrant’ countries such as Namibia and Nepal have been able to almost entirely prevent poaching of their valuable rhinos and elephants (and tigers in the case of Nepal, whose tiger population is apparently rising), would be an invaluable contribution to current conservation policy debates.